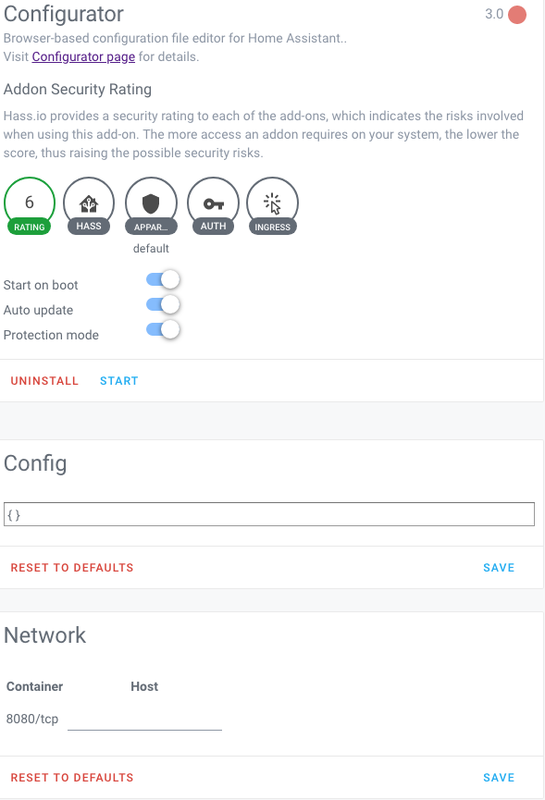 I had to update to 0.91.2 from 0.91.0 to have Configurator 3.0 to install. But now the Config field and Network host filed are empty and even if I copy from the doc page and save it does not remain. How did you roll back to 2.1? Same here. I had to restore Configurator from backup. Thanks, rolled back from last snapshot. Have you tried open configurator from web ui on addon page it is working for me. Yes, it’s working in both methods you’ve described. But since the Config does not maintain the settings, I cannot set username and password. I don’t mean to be rude but did you read the thread? 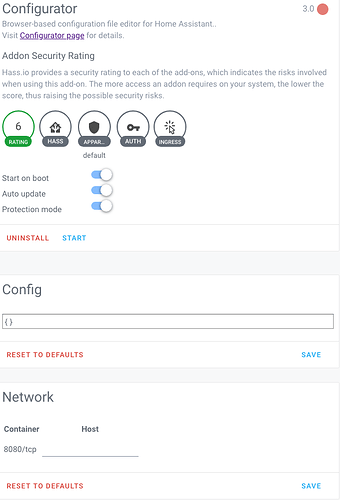 Daniel posted that the new version does not need most of those options and it uses the HA user for auth! Browser-based configuration file editor for Home Assistant. I was looking at any changes in the Github page, but probably I haven’t seen. Hmm, all my config went through with upgrade, I read somewhere when I panicked and tried to find url, that config is not necessary now. When you open web ui in a browser you can see all url ports etc. I mage my hassio via docker not by burning image on sdcard. Simplistic configuration UI Share your Projects! I was looking for Configurator or Configurator Addon, but if the name os different from the Addon name it’s not so easy to find. Yeah you’re right… it was a little hidden. God i’m never going to get any work done now! I can do Lovelace and yaml. The proper http address can be found as well inn Configurator log on addon page. Easy. This is for noobs as myself who spent 3hrs to worked out this stuff, but it was worth it I have learn a few things ;-). Thank you! I was struggeling with the iframe url as well.